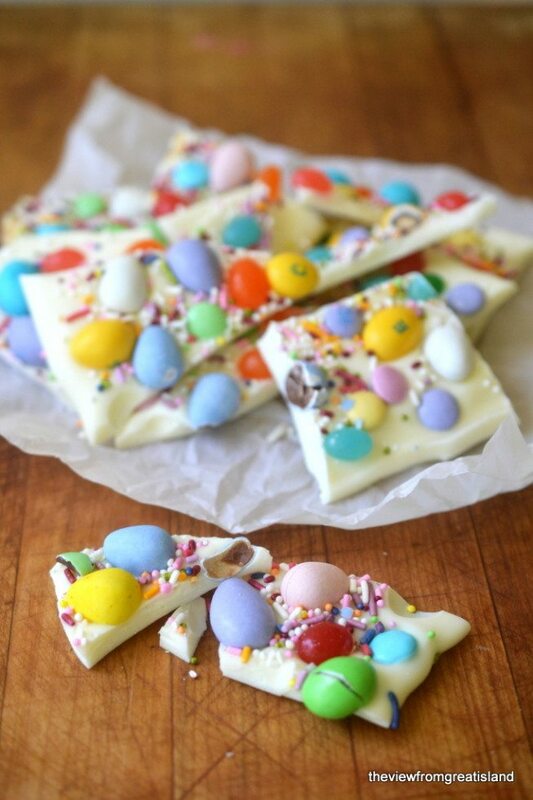 Spring Candy Chocolate Bark ~ skip the pre-fab candy this Easter and make your own! Creamy white chocolate is studded with your favorite holiday treats, and takes only minutes to make! 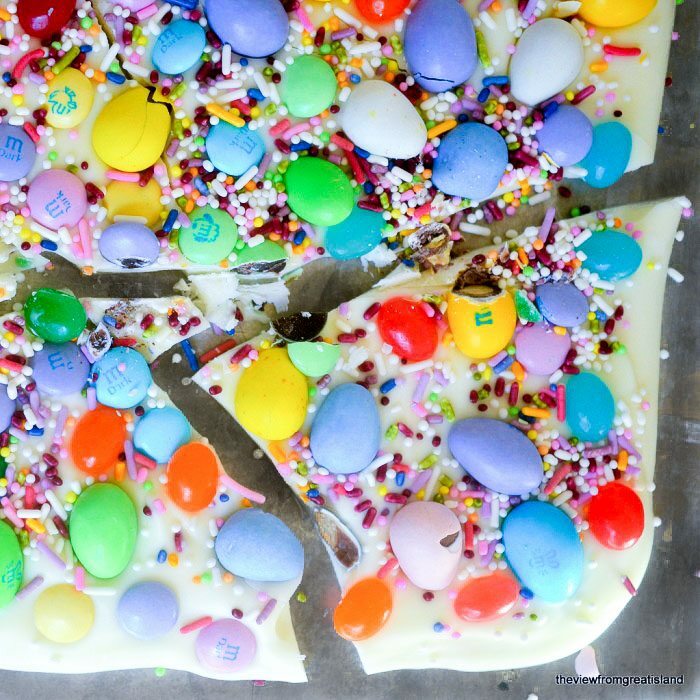 I was so enchanted when I saw versions of this Easter bark candy around the blogosphere this week that I had to try my hand at it. 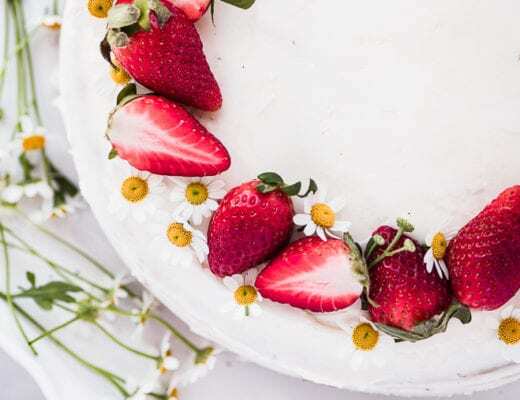 This is the idea…steal a few of the candies earmarked for your kids’ Easter baskets and embed them in a thick layer of molten white chocolate. When it firms up you can shatter it into shards of white chocolate and Easter candy bliss. 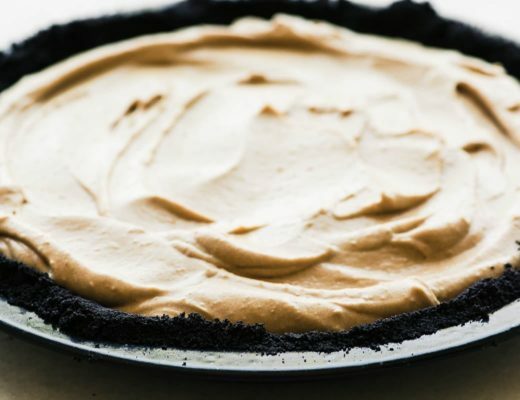 Snack on some with coffee while the kiddos scramble for the eggs. No kids? Now you have an excuse to pick up some spring candy — you know you want to — buy a few of your favorites and go to town. I don’t usually call out specific brands in my recipes, but in this case I have a clear preference for Nestle white chocolate chips. I prefer the texture and color, and they melt very easily. I’ve tried all kinds of white chocolate, including the luxury brands, and for this purpose I think Nestle is best. All you’ll need is one bag of white chips. And some pilfered Easter candy. I recommend the sprinkles, they add a festive touch. I even have a recipe for HOMEMADE SPRINKLES. And if you want to try another colorful homemade bark, check out my MARBLEIZED CHOCOLATE BARK. If you have trouble melting white chocolate, you can use white confectionery instead. If comes in bricks, and in wafers and it’s made to melt easily for candy making. You can find it HERE. Put the chocolate and the Criso or coconut oil into a microwave safe glass bowl. Make sure it is completely dry. Microwave in bursts of 30 seconds, stirring in between, until the chocolate softens and begins to melt. Stir to encourage all the lumps to melt, letting the heat of the chocolate finish the job. Be careful not to over-microwave the chocolate or it will 'seize' and turn into a hard mass. Microwave in short bursts and stir in between and you'll be ok.
Pour the chocolate onto a baking sheet and gently spread the chocolate out into roughly an 8x12 rectangle. Scatter the candy and sprinkles evenly over the hot chocolate, and press down lightly to make sure they stick. 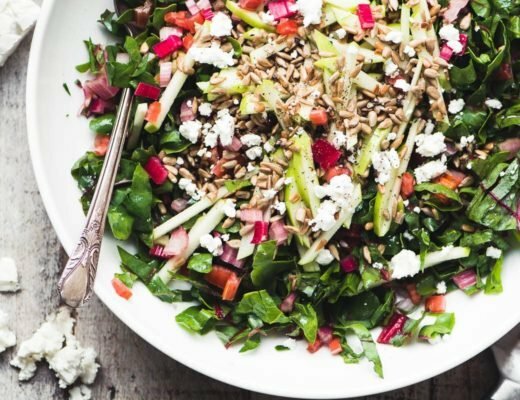 Let the bark harden, either at room temperature or in the refrigerator. Cut into shards before serving. Don’t forget to pin this Spring Candy Chocolate Bark! This looks so fun and festive! I adore Easter and Easter treats! Now who wouldn’t love this! The colors are great and so easy too. Very nice Easter treat! This is really festive and pretty! 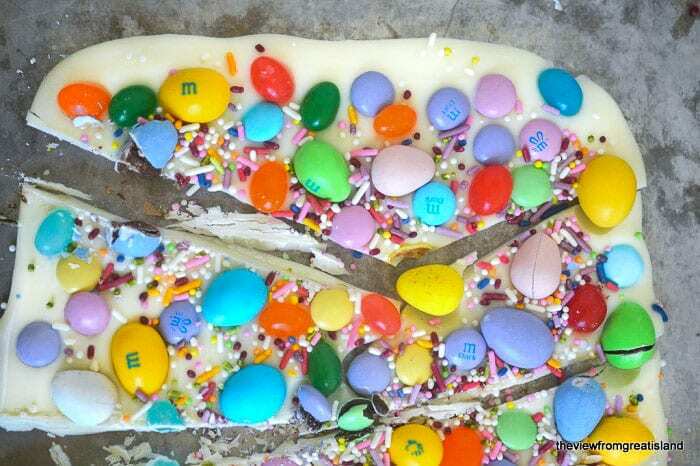 I love Easter bark, yours is so fun and festive! 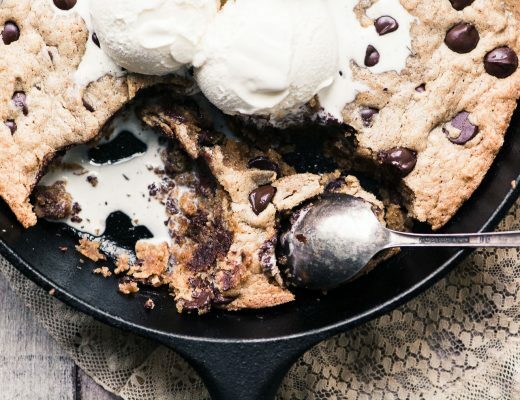 This would be delightful for Easter Sunday….Thanks for sharing it. Seriously, homemade sprinkles? Now that I have to go and read after this! I’ve just ‘discovered’ chocolate bark over the last half a year or so and have made it so many times already for gifts. I think it looks so classy for so little effort and I love that you can personalise it so easily. Actually, now you really have me thinking. 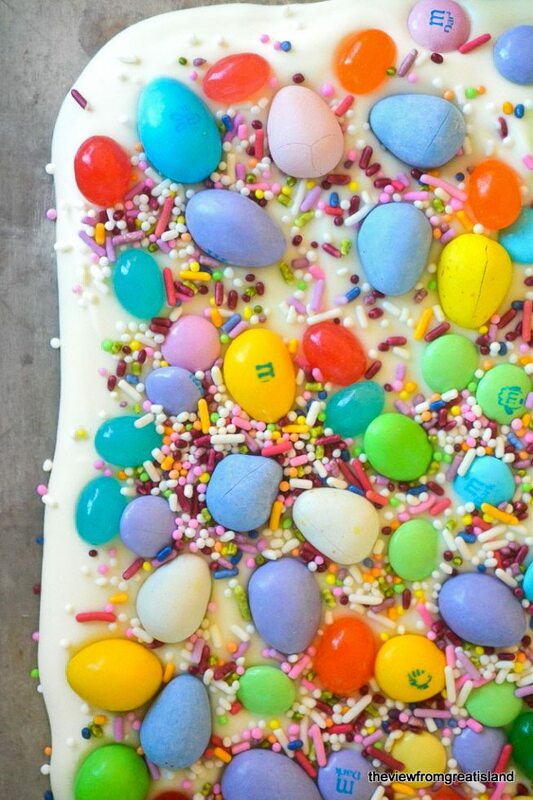 I’m going to a baby shower on Tuesday and I think I might just make a version of this Easter bark to take along as I really won’t have much time before I go. Brilliant. Thanks for the inspiration, Sue! I agree, bark is the classiest easiest gift there is. I love the idea of using it for a baby shower… if you know whether it’s a boy or a girl you’ve got perfect color palette to work with! What a fantastic idea, so adorable. Love this! Sometimes the cuteness factor is enough to make me want to make something, in this case, it tastes good too!